The Philippe Professionel used to be one of the favorite handlebars of racers and randonneurs alike. 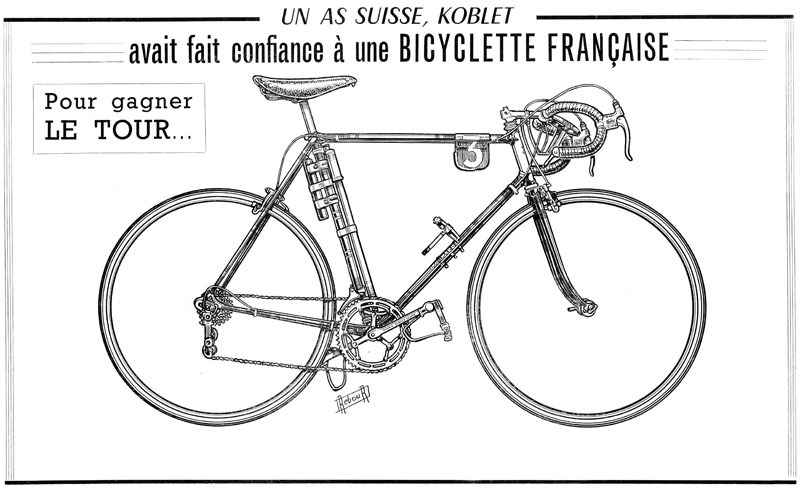 In 1951, Hugo Koblet won the Tour de France with these handlebars. You even saw them on track bikes! What makes them special? The long ramps are parallel to the drops. That looks really neat, but more importantly, it provides very comfortable hand positions behind the brake lever hoods. (On track bikes, which don’t have hoods at all, the ramps allow the rider to use that position without risking to slide off the bars.) The long drops also enable riders to move their hands around as they ride long distances. So why don’t racers use these handlebars any more? The long parallel ramps get in the way of your wrists when you throw the bike from side to side during an out-of-the-saddle sprint. In the 1940s and 1950s, most professional racers sprinted seated, winding their relatively small gears up to 180 rpm and more. When stages became shorter and leadouts became more common, racers began to use larger gears and sprint out of the saddle. Philippe responded to this change by modifying their Professionel handlebars sometime around 1970, increasing the slope of the ramps a bit, as on this 1970s René Herse Longchamps. Comfort in the “behind the brake hoods” position is slightly decreased, but you now can throw the bike from side to side. With the shorter stages, hand comfort was less of an issue for professional racers anyhow. Together with the AVA Randonneur, the two models of the Philippe Professionel are my favorite handlebars. I prefer the 1950s version with the parallel ramps, because I rarely sprint out of the saddle. However, my Alex Singer is equipped with the 1970s version, and even those were very comfortable during the 50 hours of non-stop riding of Paris-Brest-Paris. After years of having to use old handlebars on my bikes, I was excited when Grand Bois began to offer replicas of my favorite handlebar shapes. 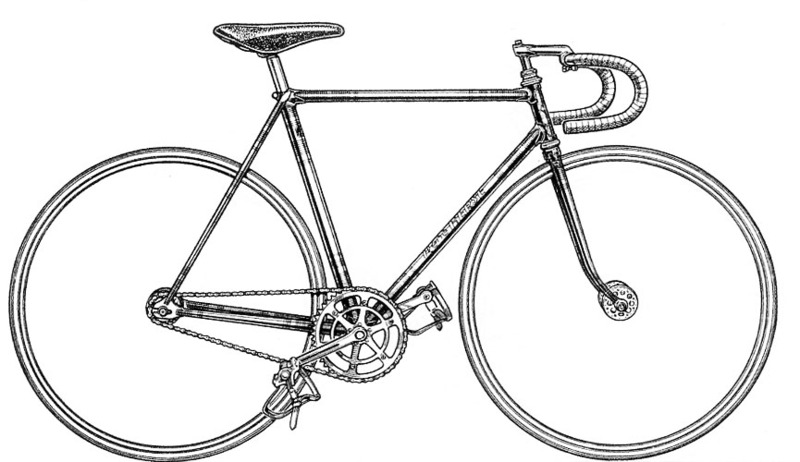 Grand Bois’ Randonneur replicates the old AVA. The Maes Parallel is a copy of the 1950s Professionel. The Maes 1970s owes its shape to the 1970s Professionel. All Grand Bois handlebars are made by Nitto, to their highest “Superlight” specifications. 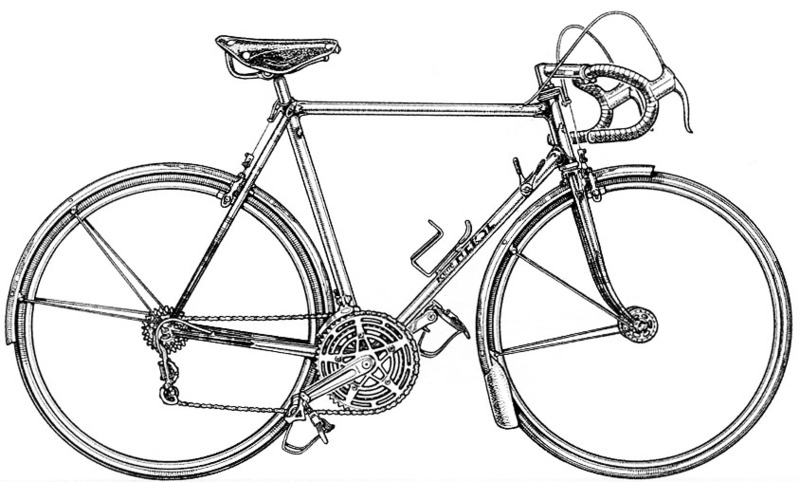 Grand Bois handlebars have been similar in width to the French originals (40-42 cm), but some North American riders prefer slightly wider handlebars. I finally persuaded Grand Bois to offer a 43 cm-wide Maes Parallel. If that proves popular, we may offer other shapes in wider widths as well. All images above are by Daniel Rebour. This entry was posted in Handlebars, Product News, Testing and Tech. Bookmark the permalink. I find the longish drops on the GB Randonneur to be where I spend most of my riding time. I only ride the hoods/ramps on sustained climbs. On short, roller hills I do sometimes bump my wrists as I get out of the saddle to avoid having to down shift. The only part of the bar I’m not crazy about is the tops of the bars since they flare upward which feels awkward to hold. Fortunately, the ramps are comfortable enough that I usually no longer ride in that position. The narrower 410mm width has been a non-issue for me. I think the Philippe Professional long-parallel bars with the long reach have the same parallel geometry as ‘Raleigh Bars’ found on Raleigh bikes of the 1970’s ( Raleigh no-name bars on “Record”, “Grand Prix”, etc., up through The “International” model.) They are by far my favorite bars because the tops have so many hand positions, and by contrast, I absolutely hate cinelli bars which have very little space for my poor hands on the tops !! The Cinelli bars are great for their intended purpose: racing over comparatively short distances. When you are racing, you put out so much power that your upper body is lifted up as your legs push down. The main thing you want from the bars is keep them out of the way. Most of us don’t race, and when you go slower (and/or further), you need more hand positions and better support of your palms. And for that, the bar shapes that were used by riders and racers who spent more time on the bike (at lower power outputs) are better choices. Thank you for the history and comparison. I find this all very interesting, since I’m trying to decide on bars for my first rando build at the moment. I hope you’ll follow this post up with your thoughts on GB/AVA randonneur bars, both as they compare to the Philippe Professionels and as they compare to other rando bars (especially Nitto and VO). I use the Nitto model bars that closely, but not exactly match the Cinelli 64 bars, in 42 cm width. I note that the bars you link to above have a 25.4 clamp size. I’d like to give the Maes bars a try to get longer ramps that are parallel to the drop. Would you happen to know which Nitto bars with a 26.0 clamp size might closely match the Maes bars you mention? All Grand Bois handlebars measure 25.4 mm at the clamp. There is a Nitto model that is a sized-down version of the Philippe “Professionel,” but that negates the advantages of the flat ramps – they are just too short. If Nitto or anybody else made anything closely approximating the Philippe Professionel, Grand Bois would not have made theirs! You can easily shim a 25.4 mm bar to 26.0 mm, using some aluminum stock (“Coke can”). Nitto makes a shim, too, for that purpose. 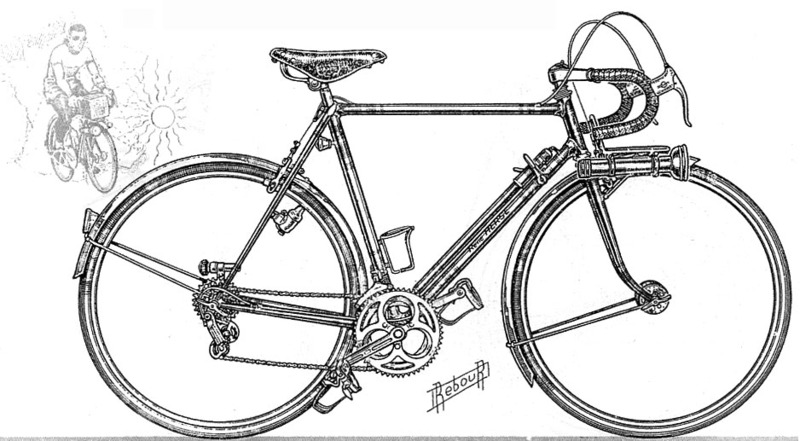 René Herse Bicycles has them, and we will see about getting some as well. Jan, if you don’t mind naming it, which model Nitto bar is a sized-down version of the Professionel? I would love to try the Grand Bois bars but they are too expensive for me right now. I would appreciate knowing about a cheaper (though less ideal) alternative. The scaled-down Professionel copy is the Nitto B-115. I have a 42 cm-wide sample, never used – if you or anybody else with small hands wants it for $33 plus shipping, contact me directly. You made me want ‘Diagonale’ bars. What do the handlebars look like from above, aka how it looks to the rider when sitting in the seat? Side views don’t really make them look much different than the average drop bars, vaguely different but I not being an expert, I don’t know why.